Dario Argento’s Suspiria is a sacred cow among horror fans. The original film is a dense, multifaceted work that, to many, gets by more on atmosphere than on plot. Argento’s films have always been more about the journey than the destination, but what makes Suspiria stand out is the incredible cinematography, as the film takes you to places we aren’t supposed to go and gives us images that we aren’t supposed to see. The bright colors, the surreal score by Goblin, the nightmarish dread – they aren’t easily duplicated, even by Argento himself in his later films. It’s by no means a casual film, but in watching it, you can understand why it would inspire horror fans so deeply. So you can imagine the outcry when Luca Guadagnino announced Suspiria as his next project after Call Me By Your Name. It wouldn’t seem to be the obvious choice, other than a shared nationality. 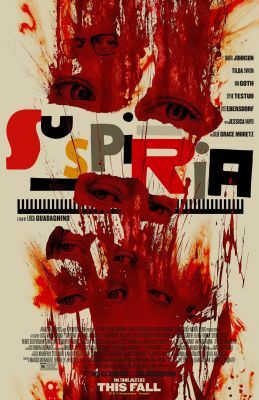 Guadagnino saw Suspiria when he was a teenager and vowed at the time that he would remake it. The ideals of youth give way to more practical matters, but Suspiria never left Guadagnino’s mind. The result is a film that is markedly different from Argento’s – the original film serves as an inspiration, but Guadagnino has no interest in repeating the past, and by doing so shows his true love for the source much more effectively than if he had simply re-shot it. This Suspiria encourages taking those paths less traveled, exploring the darkness in myriad ways, finding the profound in unexpected places. This may be the best remake of its kind since David Cronenberg’s The Fly. The basic premise is the same. Ingenue dancer Susie Bannion (Dakota Johnson) joins a dance school in Germany, but soon discovers that everything is not as it seems – not with the school, and not with the school’s matriarch Madame Blanc (Tilda Swinton). But Guadagnino, again, isn’t interested in rehashing the original. He’s interested in exploring a myriad of different themes and ideas. Suspiria takes place during the Baader-Meinhof kidnappings, and those events serve as a backdrop to Susie’s induction to the school. It becomes obvious early on that Susie is incredibly gifted, and Blanc senses that Susie could be of service to her. The school’s board of directors is undergoing change, with two factions – one led by Blanc, the other by the enigmatic Madame Markos. Both try to twist Susie for their purposes. Meanwhile, one of the school dancers, Patricia (Chloë Grace Moretz) has gone missing, and her therapist, Dr, Josef Klemperer (Lutz Ebersdorf) goes looking for her. To reveal more would be unwise, but if you’ve seen the original, you know that all is not well in the darkened hallways of the dance school. But Guadagnino and screenwriter David Kajganich, again, aren’t interested in doing what has been done before. Instead, they use Argento’s template to explore themes of feminism, politics, the trappings of history and the transference of power. This is a deep, rich mix, and the film would much rather the audience ride with the flow than to stop and examine every facet. Time enough for that later, because Suspiria feels like a film that reveals its layers with subsequent viewings. There is a wealth of riches for audiences to explore in Suspiria. The cinematography is stunning, but in an entirely different way than Argento’s film. Cinematographer Sayombhu Mukdeeprom shoots post-war Berlin with muted colors, shades of amber and brown, but as Suspiria progresses, the chaos and entropy make their way into the lens. It is markedly beautiful work and stands apart from what Argento did. The choreography of the dance sequences is remarkable. It feels like the actors are dancing on the edge of a razor, and each sequence is given a different kind of intensity that sets them all apart. One particular dance, as Susie introduces her abilities to Madame Blanc, is interwoven with such wonderful, terrifying scenes of body horror that I wanted to applaud. Those believing that Guadagnino holds back from either the gore or the horror are misinformed. Suspiria may have a lot on its plate, but it is still a horror film, through and through. Thom Yorke’s score is sumptuous, growing more discordant and cacophonous as it progresses. Again this isn’t a film that is interesed in copying, but instead of using the original as a foundation. Yorke isn’t riffing on what Goblin did, because how could you? It’s too iconic. Instead, Yorke forges his own path, and the film is better for it. The past is a prison, and it is such an insidious one because we do not realize we are being bound. We repeat the same mistakes, follow the same roads, because we literally do not know another way. It takes a fresh perspective to see outside those walls, and many simply are unable to do so. 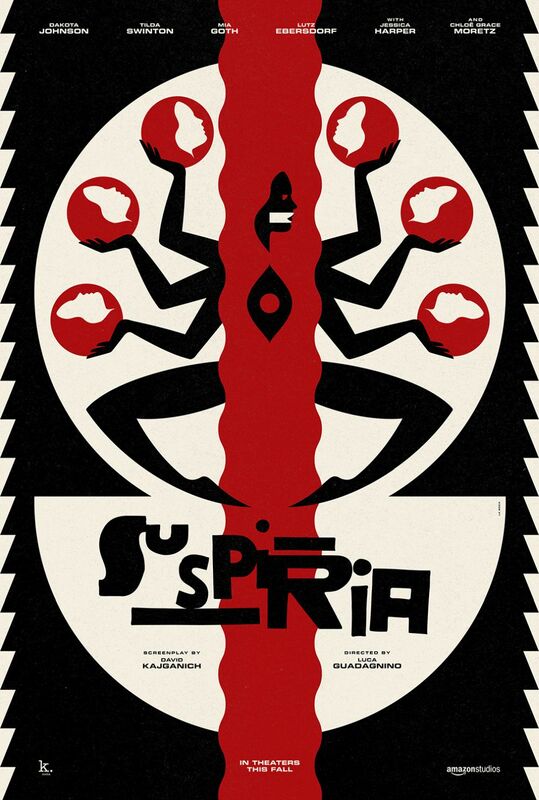 Suspiria explores that through many prisms – the prism of feminism and the changing of the old ways into the new, the prism of politics and how we use the past to inform ourselves even as we begin to feel trapped by it, and even the prism of filmmaking as a director uses the past as a source of inspiration and exploration without being bound by its constraints. That’s a lot for a horror film to carry, and casual audiences will likely reject what Suspiria is offering. This isn’t simple entertainment; Suspiria has a lot – a LOT – on its mind. It may not be obvious at first, but I have the feeling that this film will end up being just as highly regarded as the original, and that, like the original, a young film lover will see it and use it to find their own path. The best remakes take what has been done and build their own house off that foundation. Suspiria is a mansion in that regard, and some of its rooms are not places best explored alone in the dark. This is a great film.